•	The fundamental concepts of partitioning, replication, and resource governance for building and configuring scalable applications that are agnostic of a Cosmos DB API. •	A basic working knowledge of the Cosmos DB SQL API. •	Describe the purpose and architecture of Azure Cosmos DB. •	Describe how to design documents and collections to meet business requirements, and how to use the SQL API to build applications that use these documents. •	Describe how to create user-defined functions, stored procedures, and triggers. •	Describe how to tune a database, and how to monitor performance. •	Describe how to create efficient Graph database models using Cosmos DB. •	Describe how to use Azure Search, HDInsight, Azure Databricks, and Power BI with Cosmos DB to query and analyze big data. •	Create and configure a Cosmos DB. •	Migrate data from a Mongo DB database to a Cosmos DB database. •	Describe accessing data using the SQL API. •	Describe how to protect data in a Cosmos DB. •	Design NoSQL document structures that support business requirements and enable efficient operations. •	Describe how to perform SQL queries against a SQL API database. •	Explain how to insert, modify, delete, and query data in a SQL API database programmatically. •	Implement the shopping cart functionality in the online retail system. •	Extend the online retail system to create orders from the items in a shopping cart. •	Extend the online retail system further to enable customers to view orders and backorders. •	Describe how use create triggers that you can use to maintain integrity when inserting, updating, and deleting documents. •	Describe how to tune the configuration of a database and collections for best performance. •	Describe how to assess the performance of a document database and identify options for improving throughput. •	Describe the features that Cosmos DB provides for implementing graph databases. •	Design NoSQL graph structures that support business requirements and enable efficient operations. 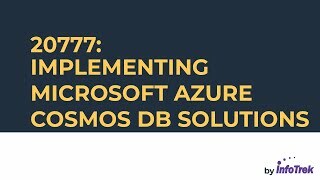 •	Describe how to integrate Cosmos DB with Azure Search to perform efficient query processing over big data. •	Describe how to analyze big data held in Cosmos DB using Apache Spark. •	Describe how to visualize data in Cosmos DB using Jupyter notebooks, Power BI, and Azure Databricks. •	Describe the Cosmos DB change feed, and how to use it to process data efficiently. •	Explain how to incorporate Cosmos DB into streaming solutions such as Apache Kafka, Apache Spark, and Azure Stream Analytics.